My journey through life with boys, our real food adventure, and finding joy in the mundane. Oy…October snuck up on me. But, since it is here, I must confess…I love Fall. I love everything about Fall. I love pumpkins, and mulling spices, and the color orange. It is time for warm sweaters, and cute knee high boots, and scarfs. And, check out this AMAZING pumpkin latte recipe!!!. I spent a long weekend with a friend down in San Diego. We stayed up late chatting, drank some wine, and squeezed in a few hours of amazing training on some chemical free products. It was a nice little break from the norm. Breaks from the norm make dinner menus LATE. This creature of habit is out of whack. 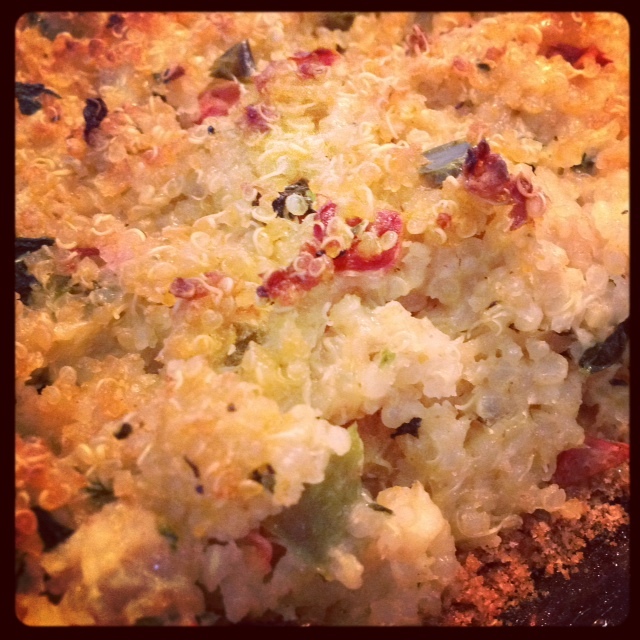 Last week’s menu winner was the quinoa bake. It was SO easy, and was really tasty. I blessed another family that welcomed a new little one with this meal as well, and they were impressed. If you you are even slightly open to cooking with quinoa, this one is a fabulous place to start. Sunday: We actually got take out from Chipotle. Food Babe recently did a piece on what to eat at Chipotle, and I feel semi-ok with their menu. Wednesday: Chipotle Chicken sweet potato skins. Sweet potatoes are a very close second to anything that is pumpkin flavored. Could be that they are both orange. Regardless….I am anticipating this meal most. Friday: Fish taco bowls. We have been talking about this dish since the last time it made it on a menu. It was time. Saturday: Pumpkin pancakes. (You knew it was coming.) Subbing in maple syrup for the brown sugar, and will make enough to freeze. Given my love/obsession with pumpkin, I am planning to give these pumpkin muffins a go this week as well. Can.not.wait. For real.